Welcome to my latest dividend income update. For those of you new to these posts on my site, every month I discuss our approach to investing focusing on Canadian dividend paying stocks. We believe buying and holding a number of Canadian dividend-paying stocks in our tax-free (thanks TFSA!) and non-registered accounts will, over time, provide some steady monthly income for future wants and needs in retirement. With the calendar now on August, it’s time to look back and see how we did last month. This month, I’ll continue to answer a few questions about our portfolio in these updates. Mark, you mentioned in a recent update you don’t intend to sell any of your 30-40 Canadian stocks. The reason is, you’ve essentially created your own Canadian dividend ETF with banks, pipelines, telcos, utilities and energy companies. Have you been tempted to buy “pot stocks” or ETFs to join that craze? Fair points! She is right of course – we have done OK over the years based on our solid plan to date. So, while I have been tempted to buy more pot stocks or ETFs there is only one in my portfolio now – Aurora Cannabis (ACB). I own a very small portion of it. It represents less than 0.1% of the overall portfolio actually. It’s in the portfolio to see how speculation may work in this sector or not at all – to her point. 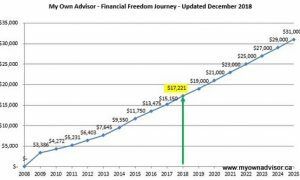 I recently read your age 50 financial freedom update – including your goal to own a $1-million portfolio in five or so more years. Have you considered buying more ETFs as you get older to diversify risk away from Canada? Actually, I’ve already started to do that. While I believe our current basket of 32 Canadian stocks is fine to cover the Canadian market, largely the same stocks the big funds in Canada own (see examples here) I know Canada only represents somewhere in the range of 3-4% of the global market. Therefore, if you only focus on Canada you might be missing out on healthy returns from around the world. So, to avoid our fear of missing out, we own some stable blue-chip U.S. dividend paying stocks (like Procter & Gamble, Johnson & Johnson) and some U.S. listed-ETFs, companies and ETFs that are built to last in your portfolio. We put those assets in our RRSPs for many reasons listed here. Over time I know I will own more U.S. stocks and/or units of U.S.-listed funds like VYM that provide both income and growth, to further diversify the portfolio. Beyond those U.S. funds I will likely own some Canadian-listed funds like VXC or XAW in our TFSA or RRSP – so we can own thousands of stocks from around the world for long-term growth, making my portfolio almost bulletproof through equity diversification. Owning either fund I can also avoid currency conversions. You can read about some of the best low-cost funds for your TFSA (and other investing accounts) here. Mark, can you clarify your income goal – is it $30,000 from the entire portfolio or just assets inside your TFSA and non-registered account? Why not have an income goal for the entire portfolio? OK, to clarify, our passive income goal of earning $30,000 per year is linked to our TFSAs and non-registered accounts. It does not include income that could be, rather, will be generated by our RRSP assets. Well, I’ve always reported it this way so I guess I’m too lazy to change it now! The other reason I report it this way is because I know we’re likely to draw down our RRSP assets in semi-retirement and not touch the capital in our non-registered account or TFSAs until later on. The order of drawing down one’s assets in retirement is not an easy equation and there are other retirement income considerations to think about here. We’re confident if we can earn $30,000 per year in dividend income, beyond our RRSP assets, then we should be able to stop working (or at least work on our own terms for as long as we wish). This $30,000 per year income, that is tax-efficient and tax-free (thanks TFSA!) along with some RRSP withdrawals in our 50s and 60s, AND other assets like government benefits and workplace pensions in our 60s, will almost certainly be enough money to sustain our lifestyle. Your mileage may vary! If I was to guess what our income goal would be from our entire portfolio (beyond future government or workplace pensions), to “live off dividends” I would guess that’s in the range of $50,000-$60,000 per year (pre-tax). In closing, I’ve learned money that stays invested can make more money over time. I hope you are learning that from this site too! Using that principle to our advantage, at the end of July, we’re projected to earn more than $16,550 in dividend income this calendar year in some key investing accounts – nearly $1,800 more than this time last year – by doing little else beyond maxing out our TFSAs, owning the same boring dividend paying stocks, and staying invested in them. I’ll keep you posted (including if we surpass that milestone) in the coming months. Thanks for your questions folks. Keep them coming via some comments below! 11 Responses to "July 2018 Dividend Income Update"
I don’t see an allowance for inflation in your $30,000 income goal. 30,000 in today’s dollars will not cover the same kind of expenses 30 years from now. An annual 2% income increase may be a minimum requirement. I suppose one could assume that annual dividend increases could cover more than that, and eventually a drawdown of capital. Thanks for being a few fan. Good point about inflation. However, the way I see it, the dividend growth should easily cover inflation. Looking at this year as an example a good portion of the $1,800 new money over July 2017 is not because of TFSA contributions (that only added about $400-$500 in income) but dividend increases and reinvesting those dividends paid. If I simply take the income as cash, and made no reinvestments, there would still be dividend increases to help offset 2% or 3% inflation or even more. And, you are correct, should things really get out of whack at least I could draw down the capital. The arguments against such an approach are: 1) you need a great deal of capital to “live off dividends” (only partially true) and 2) you are cherry-picking companies that pay dividends – there are no guarantees that come with dividends being paid in the future as in the past. You’re still adding “new” money to the non-reg accounts? For the most part, no, not unless I find a good deal 🙂 TFSA and RRSP are maxed for me. Gotcha. TFSAs, RRSPs, debt reduction. Yup. TFSAs, done for 2018. RRSPs, largely done for 2018. Debt, killing it. If there is deal to be had, non-reg. investing. Right now, the priority remains on debt reduction for 2018. Often I’ve thought about investing a small portion of our portfolio a bit more actively, maybe 1-2% of our overall net worth, I could see pot stocks fitting within that 1-2%, but I would consider them to be a speculative investment and wouldn’t make it a big portion of my portfolio. Low-cost ETFs work very well for the majority of investors and I wouldn’t encourage anyone to change their plan if it’s working for them – if they are meeting their goals. Agreed Owen. Looking forward to your email reply. Wow! The market sure liked the BAM.A second quarter report. They are a major conglomerate. Likely a cash cow for decades to come.